Find All Answers to Your Air Duct Cleaning Questions Here. An in-depth study of the best air duct cleaning methods used by our professionals. What should I do if my air ducts start to leak? As far as this problem is concerned, experts at Air Duct Cleaning Redondo Beach recommend an urgent air duct repair service. In that event, contaminants will be prevented from entering your house and on top of that, you will not have to deal with energy losses. What kind of air duct cleaners should I purchase? It is well-known that most of those air duct cleaners contain harmful chemical biocides. In the light of this, you should try and buy an organic solution. Even if it is more expensive than a standard detergent solution, it reduces the amount of pollution that is generated outdoors. How often is HVAC maintenance needed? If the HVAC system is used daily, our professionals would recommend HVAC maintenance at least once every six months. It will ensure the unit stays clean and free of problems. Your energy bills will be regulated with HVAC unit repairs and its efficiency will be guaranteed. UV cleaning is a new and more modern way of filtering air of its contaminants. This method targets the organisms and germs that may be present in the air. 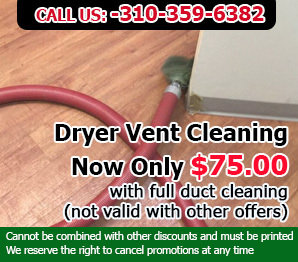 According to our experts, this is an effective, though uncommon method of air duct cleaning and air filtering. This depends on a few factors. These include the capacity of the dryer and how often it is used. The vent’s size, make and setup also determine how quickly it can get blocked by lint. It's best if you create a cleaning schedule based on past experience. Generally, the more often the vent is cleaned the lower the risk of dryer inefficiency and fire.